A “Special Edition” of NRANews.com highlights the perpetual NRA trophies awarded at the NRA National Championships. In this webcast, reporter John Popp and Mike Krei, Director of NRA’s Competitive Shooting Division, tour the Camp Perry Trophy Room. The Trophy Room holds roughly 130 statues, cups, plaques, and other awards that have commemorated the accomplishments of pistol and rifle shooters for more than a century. 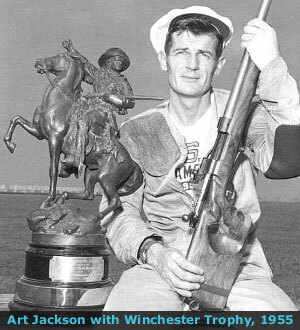 The oldest trophy dates back to the historic 1874 Creedmoor challenge match between Irish and American rifle teams. The seven-week span of the Camp Perry National Matches is only time all these NRA trophies are gathered together in one place. 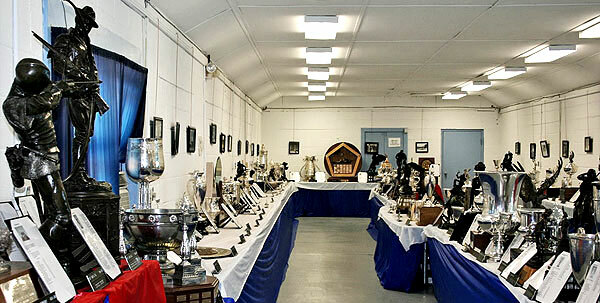 Krei explained: “[The trophies] are all in traveling cases… we bring them out annually (from NRA headquarters) and set them up [at Camp Perry] so everyone can see them.” Notable shooters such as Carl Bernoski, Sherri Gallagher, David Tubb, John Whidden, and Lones Wigger have their names etched on historic trophies like the Norman Adair Trophy, the Frank Parsons Memorial Trophy and the Wimbledon Cup. To watch the Camp Perry Trophy Room webcast, log on to NRANews.com, select “SHOW ARCHIVES” then click on the “Jul 14″ tab near the top left corner. Scroll down (using the slider bar) to find the “Curator’s Corner” link, showing a 00:15:47 play time. Click on that and the video should load on the right within a few seconds. Be sure to click on the Curator’s Corner video first — if you click on a different video you’ll have to sit through the whole thing before the Curator’s Corner Video will play. Also, when you click the Curator’s Corner Video, the actual trophy feature doesn’t start until 01:47:00 point in the clip. There will be future NRANews.com segments from the Trophy Room. These will be webcast on NRANews.com in the near future. Audio-only versions of the Trophy Room webcasts will also air on Sirius/XM Patriot Satellite Radio. 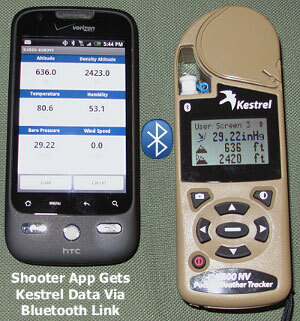 Share the post "Camp Perry Trophy Room Featured on NRANews.com"
Bryan Litz, Ballistician for Berger Bullets and author of Applied Ballistics for Long Range Shooting, has tested the latest version of the Shooter Ballistics Calculator for Android™ OS Smartphones and portable devices. This is a very sophisticated, full featured App that incorporates the latest bullet databases with Litz G7 BCs as well as a wealth of other information. It provides extremely reliable ballistics solutions at all ranges, and in all atmospheric conditions. 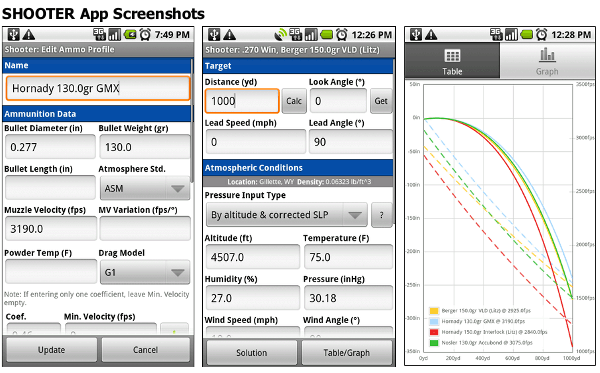 Share the post "Litz Tests Android OS Ballistics App at Ultra-Long Ranges"
Big Spring Enterprises, the Arkansas-based maker of Bore-Store gun sacks, has completely updated the www.borestores.com website. You’ll now find a modern, easy-to-use online shopping cart system with decent-sized product photos. 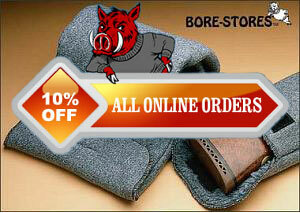 To mark the new website’s “grand opening”, the Bore-Store folks are offering a 10% discount on all online orders. Everything in the webstore is now 10% off. With the discount, handgun cases start at $4.95 and the smaller rifle cases are just $14.40. And there are also knife pouches and multi-pocket magazine stores starting at $450.00. On the updated website, it’s easier than ever to select the right size and shape for your particular firearms — from pocket pistols, to long-barreled Palma rifles. 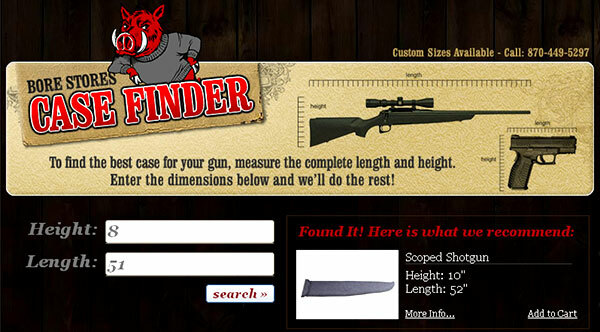 If you don’t know which size Bore-Store to order, the handy “Case Finder” tool will steer you to the appropriate product after your enter your firearm’s height (with scope) and length. For most scoped rifles, you’ll want either the 10″ x 46″ scoped rifle bag or the 10 x 52″ scoped shotgun bag (this works great for long-barreled target rifles). We recommend Bore-Stores and we use them. Our take on Bore-Store Gun sleeves is simple: They work great, so buy them and use them — for ALL your valuable firearms. These thick, synthetic-fleece sacks cushion your guns, preventing nicks and scratches. The breathable fabric wicks away moisture, and the fibers are coated with corrosion inhibitors. This Editor personally uses Bore-Stores for in-safe storage with all my guns, and I have never had one of my guns rust inside a Bore-Store, even when I lived a stone’s throw from the ocean. 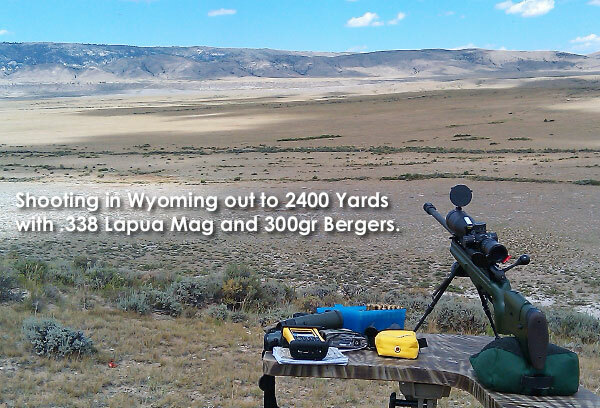 Bore-Stores are offered in a wide range of sizes, so you can find something to fit everything from a Snub-nosed revolver to a 32″-barrelled 50 BMG. Rifle-size Bore Stores can be purchased for $17.00 – $21.00 from Brownells or MidwayUSA. Of course, you can also order direct from Big Spring Enterprises at www.BoreStores.com. Big Spring will also craft custom large or unusual sizes on request. Share the post "Bore-Store Gun Storage Bags 10% Off on Updated Website"